I will come back to this subject in excuriating detail – but let’s start towards the end, where we have a number of “twins” in the clipboard, and use the “Delete twin games…” feature to actually compare the games. The idea here is to utilize a SCID’s safety feature of comparing differences between the two games PGN to find differences in the score, i.e. move list. SCID finds all the twins with a set of conditions adjustable by the user, and then sets the delete flag for what it thinks is the appropriate game to delete. The deleted game remains until the database is compacted, and SCID uses a “Twin Checker” popup dialogue panel to allow comparison, review and adjustment of both game’s delete flag. Well, <CG> has the round number for the game, and <RUSbase> has some information that <CG> is missing. 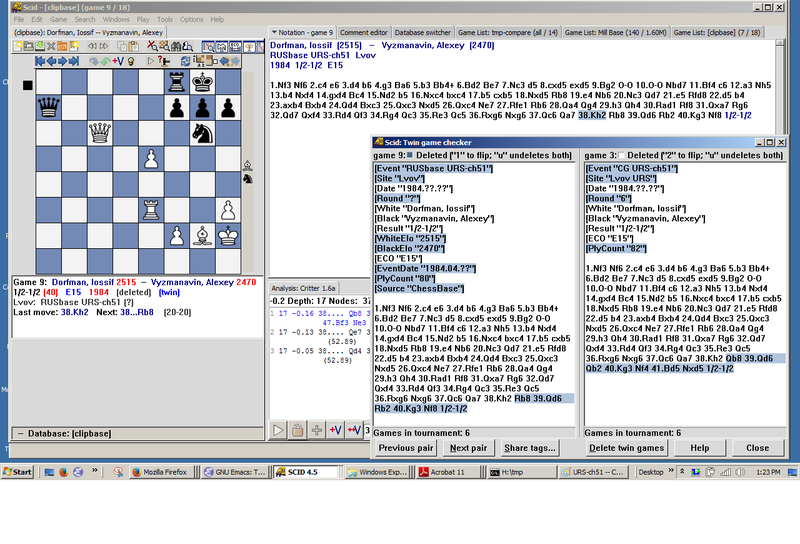 But our focus is on the moves, which differs at Black’s move 38. In fact, the two games finish differently (sometimes it’s just one move which is different, other times a simple transposition is involved). Note in the first illustration, I should SCID, which loads the deleted version. That allows playing over its moves with an engine – a useful exercise in determining “correctness” at times. Here, the engine gives CG’s more, 38…Qb8 as best. Determining the actual “correct” move isn’t as easy as just using an engine to determine the best move, since IM’s and GM’s also make mistakes. 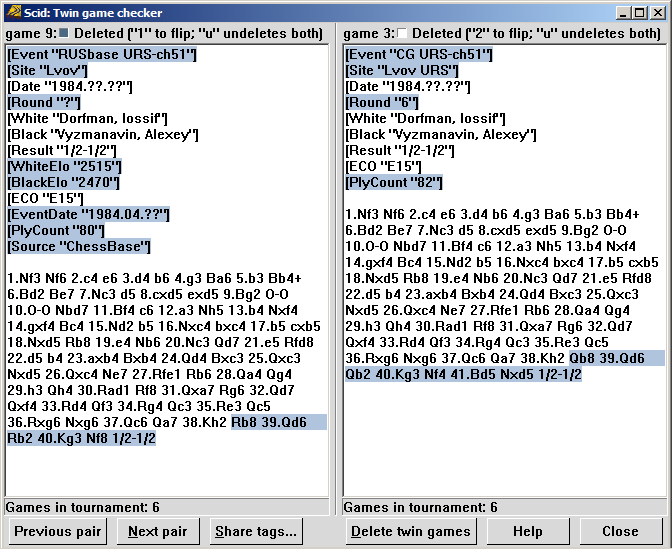 Having the tournament book is one preferred source for double checking – but that can be mistaken at times as well. The bottom line is that there is not always a definitive source for determining correctness. Stay on your toes, know your sources, document and document some more, and use your brain is the best advice. One last comment is appropriate here- i.e. if the RUSbase version is incorrect, then the [Source “ChessBase”] tag in the PGN suggests that Chessbases’ score is also incorrect. ← Hastings – The Finest Climate in Britain!